This listing is for 2 McCoy flowerpots with attached drip saucers! 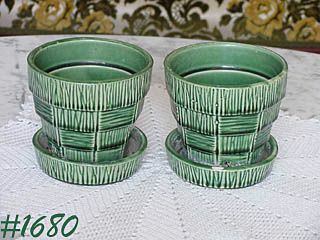 They are in the basket weave pattern and are in a pretty green color with shiny over-glaze. Flowerpots measure 4 1/8" tall, 4 5/16" diameter, and both are marked McCoy, USA. One flowerpot is in excellent condition -- no chips, no cracks, no crazing -- does have light mineral deposits in drip saucer. The other flowerpot has sustained a 3/8" x 3/16" chip on rim edge of drip saucer -- could easily be color "touched up" because it is essentially a glaze chip, not a big chunk of missing pottery. Otherwise, great condition! Nice pair of McCoy flowerpots, nicely priced to reflect one being a little less than perfect.